In celebration of this year’s Banned Books Week, which runs from September 24 to 30, Ingram is offering a special promotion to independent bookstores. As part of its ongoing support for Banned Books Week, in 2013, Ingram joined American Booksellers for Free Expression (ABFE) in creating a promotional kit that is distributed annually to members of the American Booksellers Association. This year’s kit, which included a Banned Books Week poster provided by Ingram, has been sent to more than 500 stores. This year, Banned Books Week will celebrate the theme of “Our Right to Read.” A variety of downloadable materials, including counter cards, social media images, bookmarks, web banners, and more, are available on BookWeb for ABA member stores (a username and password are required to access the materials; stores needing login details can e-mail info@bookweb.org). 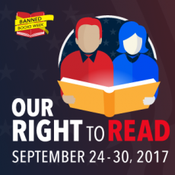 Visit the Banned Books Week website to learn more about this annual event, or follow Banned Books Week on Facebook and Twitter.